It is a 15W Adapter/Charging Module/Power Supply Module, Input voltage: DC 4~35V, Output voltage: DC.. It is a High Power PWM Controller, Operating voltage: DC 6V~90V, Output current: 8A, Control power:4.. It is a Auto Buck Boost Converter/Voltage Regulator/Adapter/Driver Module/Car Power Supply Module, I.. It is a Wireless Bluetooth Audio Receive Portable Speaker Bluetooth HD Wireless Music Receiver, Blue.. It is a PWM HHO Motor Speed Controller Support PLC Control DC Positive Inversion Controller, Working.. The DC / DC 6-32V to 0.8-28V converter, efficient high, maximum output current 15A, maximum output p.. It's a Boost Buck Regulate Power Supply,Input Voltage :5-32V,Output voltage :1.25-20V,Conversion eff.. 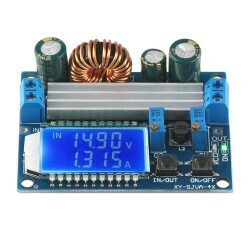 It is a 180W Digital Display Speed Controller DC 6V~30V 6A 180W PWM Stepless Speed Control Module & .. It is a Digital Tester/Relay Controller, Operating voltage: DC 8 ~ 28V (limitation DC 8 ~ 32V), Load..